In his recent New Yorker piece about cookbooks, Adam Gopnik writes, “…cookbooks have two overt passions right now: one is simplicity, the other is salt.” This recipe, originally published in Sunset magazine, offers both. The boiling sugar makes it a poor choice to make with the kids’ assistance; just let them stand back and watch in awe as you put more sticks of butter into one pot than they have ever seen you do before. Have all the ingredients prepped and ready before you begin, because once the sugar reaches candy temperature, you need to move quickly. Also, keep a bowl of ice water near the stove just in case of accidents; sugar burns badly. Preheat oven to 350°. 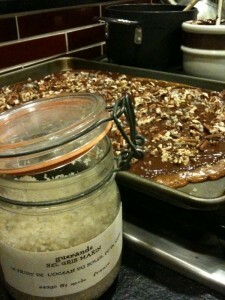 Put pecans on a rimmed baking sheet and cook, stirring occasionally, until toasted, about 8 minutes. When cool enough to handle, chop roughly. Divide into 2 batches; chop 1 batch finely. Set both batches aside. 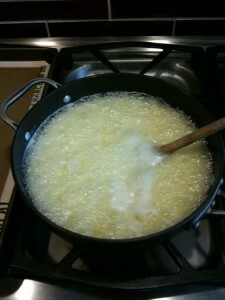 Put sugar, butter, salt, and 3/4 cup water in a 4-qt. saucepan over medium heat. If you have any doubt about the size of your pan, go with a bigger one; you want to let the sugar bubble up quite a bit without having to worry about it boiling over. 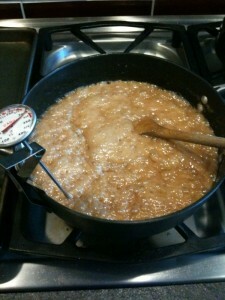 When butter and sugar are melted, increase heat to medium-high and cook, stirring occasionally, until mixture is deep golden brown and measures 310° on a candy thermometer, about 20 minutes. Remove from heat and carefully stir in vanilla (mixture will bubble up, so stand back as you pour, and/or wear oven mitts, just in case) and finely chopped pecans. Pour into a 10- by 15-in. rimmed baking sheet. Chop chocolate and melt gently in a double boiler (this is where I break out my late mother-in-law’s beautiful copper and ceramic double boiler), but a metal bowl set over a saucepan of water, or the microwave, both work just fine, too. 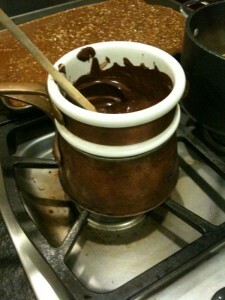 Pour melted chocolate over toffee; spread evenly with a knife or offset spatula. 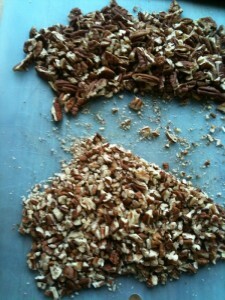 Sprinkle the chocolate with roughly chopped pecans. Let sit 20 minutes, or until chocolate is cool but still a bit soft. Sprinkle with fleur de sel. Chill until set, about 1 hour. 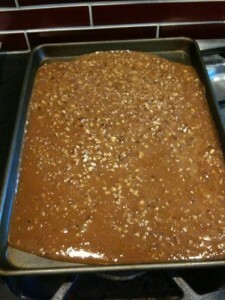 Gently twist the pan to release toffee, then chop or break into chunks. Store in the fridge, if it lasts that long. I knew there was a reason I started this project with you..! I’ll trade you my caramel how-to for this basic toffee anyday…(though I’m such a purist I think I’d stick with the walnuts….but still). Easy Tempered chocolate TK! (then you won’t even have to refrigerate). 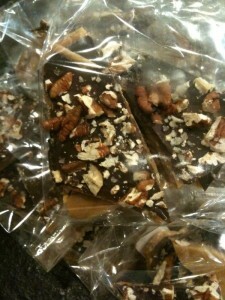 I’ll look forward to your caramel how-to, and the easy tempered chocolate process! It was so yummy, Caroline. I still haven;t made it yet myself, but I am still thinking of how yummy it was.